The Main Menu has Start, Load Game and the Making of Derek. The game is played using CD 2. The game is a typical point and click manipulation. Press ESC to see the top bar for Exit, Options, Load and Save. The Making of Derek found at CD1: Turn to the right, open the door and click on the generator. Turn around and go forward into the cave until reaching the computer. Turn on the tower and watch the making of Derek narrated by Cheyenne Wolford. Experience the powerful commitment of Derek in making the game, composing the music and his inspirations. In most scenes, whenever an action is done, wait for a few moments for the reaction to happen. You arrive on a sailboat at a pier. The sail has Nacah embossed on it. Forward to door and find out it needs an item to open it. Go to the left side and see Matthew 26:34 on wall. Go left and see panel and closed door. The panel has a lever that you can pull and rotates a set of creature pictures. Look close at the pictures after each rotation. When you look at the picture of the rooster, hear a rooster crow in the background. Open the door. Turn right and take wood plank. Click the Holy Bible and it opens to a page with a key. Take key and bible. Go back to main door and use the key on the lock. Use closed hand icon on door to open it. Enter and see a locked drawer. Take signal base and hammer from table at right. Take the 2 fuses at pullout board of the table. Go out and go to the right of the shed. Place wood plank on broken deck. Forward and left to a screwed in board on the wall. Use hammer on board and take key and the old board. Go back to central door and open it by using closed hand icon by lock. Use the key on closed drawer. Open the top drawer and take 2 signals used when lost. Open bottom drawer and take 3 matches. Go back to boat and click forward. Arrive during the night at an unknown village. You find yourself facing a fort. Another boat is at your left. Someone just turned off the light there. Swim forward to the house. Go forward to the door. Turn right and see a guard walk pass the window. If the guard sees you, he will ring the alarm bell and both doors will be closed. Do not enter the door under the window or surely he will see you. Enter the door. Look close at drawings on either side of the hallway. Enter the left hallway and see a monk go the other way. See 2 monks kneeling in front of the altar. Go forward and the monks lock you in a cell in a cavern. Look out the window and see the other boat sail away. Open the drain on the floor and go down. One of the robed priests seals the drain and traps you. Look down, turn and press the button of the panel. Panel puzzle - Press the button of the door. Remember this sound. Press the outer bolts and hear 2 different sounds. The lower tock-tock sound is a wrong bolt. The correct sound is similar to the button on the door. Press the W and NW bolts. Then press the button on the door. Go through the pipes, look down through an ornate grate and see a monk reading. Continue through the pipes, out the fort and swim to the boat. Place the wood plank at bottom of screen. Place the left signal on the plank. Insert one of the signals on the signal base. Add a fuse and light it with a match. The man at the other boat comes out and asks where are you? Place the other signal on signal base, add the fuse and light it. The man talks to you in his cabin. This is the islands of Derek, inhabited by the Mattehs. The Dalaq, a false religion and their leader, the Sinar replaced their bible with bibles in their language that the Mattehs cannot understand. The Qadas, the hope of the Mattehs fled to the mountains carrying copies of the Bible and a map. The man wants you to find the Qadas, get the map and a Bible in their own language. When you agree to help, he gives you a note that states that all that you need from the Qadas is a map and a bible. Lie down and sleep in bed. Dream and then wake up to start you adventure. The man wishes you well in your journey. Walk the path coming out of the cavern, cross the bridge and look close at the wood stand in front of a boulder blocked mine entrance. Haggai 2:8 The silver (is) mine, and the gold (is) mine, saith the Lord of Hosts. Pull back and turn right. Look at the loose soil below the crack on the boulder. Pick up the gold and silver. Mine entrance puzzle - Look close at the stand and press the buttons around it - note that the NE button has the 'correct' sound. Drop the gold and silver in the hole and press the NE button. The boulders move away and the mine is now passable. Go forward and open the brown door. Enter a striped room with a grilled floor. There are 2 doors an oval and the square door you came through. Take the cutter at left frame of the square door. Look close at center grill and use cutter on the padlock. Open the grill using the handle where the padlock was. Climb down. Turn around and see a wheel with corresponding square and round hole above it. It correlates to the doors above. Turn the wheel clockwise and a metal drops down from the ceiling. Click on right button to see a pointed thing, click again and a plumb line appears. Click on left button to see different verses. Turn right and see a key hanging on a nail at side of the panel. Take the key. Look close at the giant plumb line. Click up to use the plumb line as an elevator. Go to the other side of the metal holding the chain of the plumb line and see a keyhole. Use the key on keyhole. Go back to the other side and climb on the elevator plumb line. Click up arrow. In this brick dome, there's a metal lever and 2 panels. To Open Oval door - One panel has 3 buttons that when pushed shows 2 different verses for each button, while another panel on the other side shows a movie of a white light, graves and yellow light. Now go back to the verse panel and select the verses that correspond to the movie. Daniel 12:2 Multitudes who sleep in the dust of the earth will awake: some to everlasting life, others to shame and everlasting contempt. Ecclesiastes 9:5 For the living know that they will die, but the dead do not know anything, they have no further reward - even the memory of them is forgotten. Ecclesiastes 9:10 Whatever you find to do with your hands, do it with all your might, because there is neither work nor plan nor knowledge nor wisdom in Sheol, the place where you will eventually go. Go to the metal lever and pull it down. A sound is heard. Go down the plumb line elevator. The oval door is now open. Go through oval door and you are sealed in. Go through the passage until a room with an eye on each side. One eye has a dot and the other has a wood going through the eye. Continue onward. Eye Puzzle - See a panel on the left that has Matthew 7:, red and green button and a metal 8 in between the buttons. The red button shows a number and the green button enters the number formed after using the metal 8. The center 8 metal corresponds to the lines on the number above. By clicking on the different lines, yellow lines appear to form a number. Matthew 7: 3 Why do you notice the splinter in your brother's eye, but do not perceive the wooden beam in your own eye? Matthew 7: 4 How can you say to your brother, 'Let me remove the splinter from your eye' while the wooden beam is in your eye? Matthew 7: 5 You hypocrite, remove the wooden beam from your eye first, then you will see clearly to remove the splinter from your brother's eye. Press the center 8 to form #3, press the green button and the sound shows that it is correct, do it again forming # 4, press green button and then #5 and then press green button. The door opens. Enter a room with a ladder at the center. The door closes behind you. Look close at the ladder and climb by clicking on each rung. Go to the end of the path and see an outlet blocked by a boulder. Push the boulder. Go out. You come out to a watery crater. Go to the hut at the right island. See an electrical coil attached to a button over a body of water. Nothing happens when the button is pressed. The other island has an upraised plank with a non functioning button at its base. Go back to the hut and press the button. The electrical unit pops smoke and the water is parted. Go to the far island with upraised plank and press the button. The plank goes down. Cross the plank to the next island. Go to the hut. Open the door and enter in a room with Job 14:16 atop an altar - Surely then you will count my steps but not keep track of my sin. Go through the entryway and start counting the sound of steps taken. There were 7 thumps. Enter a huge temple. See a red stand and behind it, a circular platform lower than the main floor. The other side of the platform wall has a black button. Go to the red stand and by pressing the buttons you realized it is another elevator. Press the up button and turn right to a pulpit with black squares. The third from the top square does not have a frame. Go back to the stand elevator and press the down button twice. Turn around and see a panel. Flip the switch and press the right buttons to get number 7 on the screen. Go back up to the pulpit and see that a small panel is lit above the squares. Press 7 buttons from bottom to top and the walls in the recessed circular area rotates. Go down and see a door is now on the left side of the rotated wall and handholds on the right side of the rotated wall. Climb the handholds to see a room with a pink grilled door. Go down and go through the revealed opening at the right side of the wall. See another stand. Press the top left and right panels and see another set of verses. Find the ones appropriate to this situation. Acts 21:3 After sighting Cyprus and passing to the south of it, we sailed on to Syria. We landed at Tyre, where our ship was to unload its cargo. Matthew 5:39 But I tell you, Do not resist an evil person. If someone strikes you on the right cheek, turn him the other also. Press the middle top panel and then bottom right panel. The platform rotated and now the handhold is on this side. Climb the handhold. Now you can get up the top level. Go to the pink grilled door. There is no way to get pass the grill to the door. Go down to the stand below. Press the left bottom panel, and see a hole on the floor when the platform rotated. Rotate the platform again and go through the process of showing the hole on the floor, immediately place the cursor on the hole and click. Once on the platform, see another red stand come up from floor. Press the down button, turn right and press the lever to go left and the go back up. Press the button on the wall and you will go back to the original panel. Climb up the handholds again. The grill has swung away from the door. Go through door. Find yourself looking at a walled city. Go forward and a monk sees you from the parapet. As you get closer, another monk sees you from the tower beside the main entrance. Go forward and you are zapped by a masked monk as you enter the gate. Find yourself in another cell. Look at window and see it is night. Look at the door and see a monk pass by. Wait a little and the monk passes by again. He talks you. Give him the bible which he returns and then give him the note. He reads it and goes away. He comes back and gives you a robe and a mask. After wearing the items given, exit the cell. How can you see with this thing on? Forward, right, forward, left, forward and see a hole on the right, forward and turn right. The hole shows a lift come up and a monk gets off the lift. Enter the lift, turn around and press the down button. You automatically turn around. Look up at the coiled rope of the elevator. Use cutter to cut the elevator rope. Forward, turn right and see an elevator that doesn't work. At the other end is a wall with sword, compass and verses that are changed by buttons. Press the red button of the sword and it burst into flames. Genesis 3:24 So he drove out the man; and he placed at the east of the garden of Eden Cherubims , and a flaming sword which turned every way, to keep the way of the tree of life. After entering the verse, press the east square while the sword is aflame. Go to the opposite side of the room and press the down button. Enter the elevator, press down button and exit to the outside. Take the cross and see Daniel 2. Go forward to the statue and ramp. Climb the steps, look at the statue and see a black button that produces sparks when pressed. The statue's body parts changes. Go up further and see another button that is suppose to do something to the boulder above. Check Daniel 2 verses 32 and 33: This image's head was of fine gold, his breast and his arms of silver, his belly and his thighs of brass. His legs of iron, his feet part iron and part clay. Go back to the black button below and press the button until the statue fits the description of the verse. Go back to top button and press the button, the boulder drops and crushes the statue. Now go through the narrow opening, through the door and another door to the mountains. Find yourself in another volcanic crater. Go forward to the hut with 2 cables stretching to the side of the crater to 2 different buildings. Go around the hut and then turn. 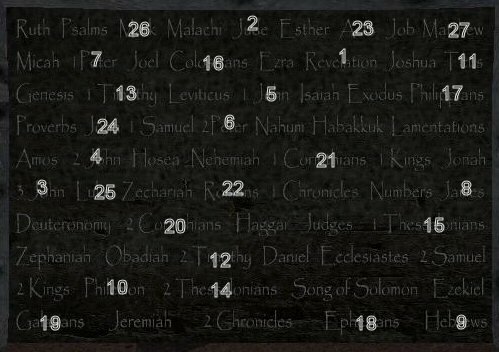 Book of the Bible Puzzle - See a board with the different books of the bible that are not in any particular order. The books have to be arranged from Revelation to Genesis. Press the bottom right button to start the time of 15 seconds per answer. 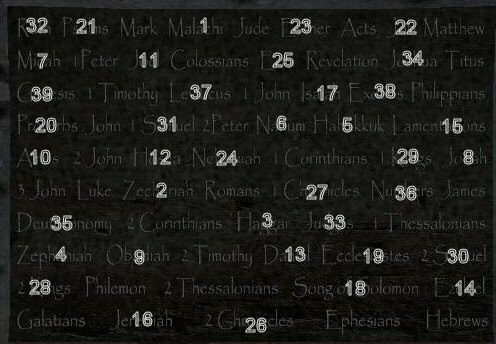 Click on all the books of the New Testament in reverse order. If the correct answer is clicked, another 15 seconds starts on the search for the next book. Now we arrange the Old Testament books in reverse sequence. If correctly done, a puff of smoke goes through the cable from the hut to the small building to the right. Go to the building right of the door you came in at other end of the path and press the lever at top left of the panel. The turbine turns. Go back and while facing the locked door, turn left to the big building to the side of the crater just behind the hut. The side of the building has Galatians 3:24 So the law was put in charge to lead us to Christ that we might be justified by faith. and Galatians 6:14. But God forbid that I should glory, save in the cross of our Lord Jesus Christ, by whom the world is crucified unto me, and I unto the world. Try to go through the tablet door. It drops down before you can enter. Place the cross at the opening and it will prevent the tablets from dropping down. Now go through and enter the wood door. Forward through the mine tunnel, out and forward to the water's edge. See a man in a rail car above. Go down and swim to the plank. Go forward until the rail car and go for a ride down the mountain. Go for a long trek up the mountains and down the valley into a settlement. The place looks burned down. At the end is a graveyard and a skeleton holding a banner. Go deeper into the mountain. When close to a lit lamp at top of the mountain, you accidentally push a boulder and alert the woman who came out of the cave dwelling. She douses the lamp. Go forward and you experience the fate of the boulder. Up you go to the cave. At the mouth of the cave, turn left to the lamp. Use the match at tip of lamp and use cutter on lamp to pick up lamp. Enter the cave to the far end. See a counter. Look close at the book on the table. The woman comes to the counter. You give the letter and she reads it. She gives you back the letter, then the map and the bible. Go to the cavern. There's no boat and the man is chained by the Dalags. After he says Farewell, take the cutter and cut the chains from his right hand before answering him. You and the man swims to safety to have the bible printed and the word of God spread to the Mattehs.